Youth basketball is an awesome sport! It is good exercise. It teaches strategy. It bonds the team members together. And it can build leadership skills in every kid who plays on your team. There are not a lot of other activities that the same can be said for (though don’t tell that to the soccer folks). As a youth coach you have an opportunity to not only lead your team by example, but to instill in each and every one of the players those desirable qualities. Leadership - What Is it Really? The problem with defining leadership is that it means different things to different people. There are thousands of books published on the topic and hundreds of motivational speakers, not to mention the teachers, public officials, clergy and everyday heroes who inspire people to be better or to accomplish their goals. Forbes Magazine has one of the best descriptions of true leadership. The article explains that leadership is an aspiration and something that everyone can work on. Even the best of leaders, who have core characteristics that make them naturally a leader, can learn and grow their skills by practicing leadership. True leaders know who they are, what they stand for, what values they hold and they communicate this openly. True leaders have integrity and credibility. True leaders listen without rushing to judgement or being condescending and are genuinely interested in others’ thoughts and feelings. True leaders are forthright and honest. True leaders give feedback and criticism from a place of compassion and a desire to teach, not punish. True leaders inspire people to be great, not command them to do things. True leaders delegate and see their roles as teachers and coaches. True leaders are not too soft, nor too hard; they will make fair demands to challenge and grow their team members. True leaders are efficient and selfless, not wasting time but spending the time they have wisely. True leaders take a long term view and keep perspective. True leaders know that they always have room to grow and to improve and that leadership is not about them, but about their team. Each person that enters into a compact with a team of kids to coach them in the sport of basketball is taking on a leadership role. Those kids, your team, will be looking to you to lead them and to teach them. You can get your hard skills like drills, workout routines and practice plans from Hustle Fitness. Leadership on the other hand, is a soft skill that you can impart with every interaction. Thinking of basketball as youth leadership skills training will bring a whole new meaning to this job. It is never too early for kids to start developing leadership skills and sports is a great place to start. This idea might not cross their mind, as they are there to play a game. Some take that game very seriously and are in it to win and to expand their basketball skills with the goal of going pro some day. Some are there to blow off steam or due to love of the game. Whatever their focus when they are in practice or at a game, you, their coach, can help them practice leadership. Teach children to empathetically listen and see things from other points of view. Give children problems to solve. Teach children how to work with teams. Provide leadership opportunities for children. Teach children how to develop strategies and plans. Help children take action to solve problems. Michael Jordan is one of the most recognizable names in basketball, with not only his superstar career with the Chicago Bulls, but also his still very popular line of athletic shoes and gear. Jordan is a master of basketball hard skills and a true leadership inspiration to many. He played with a passion and commitment that made him the most valuable player in the sport. Using this superhero of the court as an example for your team will immediately help them connect to what you are teaching them - after all which of them would not aspire to be as great in life, or in the game, as he? Jordan is a man who learned every aspect of the game he was paid to play and he constantly worked on improving his skills. He thrived under pressure and trusted his teammates who he worked closely with. He was probably born with natural talent, but he practiced and studied and honed his skills. Michael famously told his teammates at a change management meeting for the Bulls, “there is no I in team, but there is in win.” He reiterated that sentiment when he was inducted into the Hall of Fame. (Source). When you pull the team together at practice ask them to repeat that. Have them study Michael Jordan’s games and come up with ways to be more like him as homework. In pregame huddles and post game de-briefings talk about what Michael would do. There is a great website, Addicted to Success, which has 75 inspirational quotes by Michael Jordan that you can have those kids read. 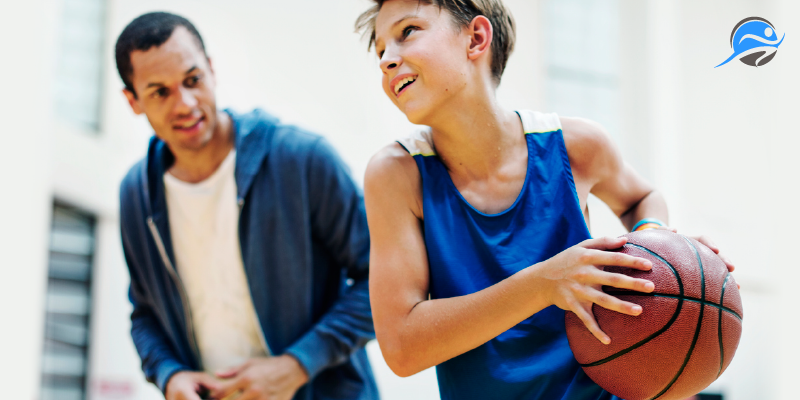 Model leadership to your team, let the master of the soft basketball skills do the talking for you and watch how they each turn into a leader in their own right. What is Championship Level Defense?